You can stop destructive teeth grinding at night -- you just need a custom nightguard from your Mt. Pleasant, TN dentist Dr. Goodman! The team at Goodman Family Dentistry is happy to offer our patients relief from nighttime tooth grinding, which is also known as bruxism. Keep reading to learn more about this common condition and then schedule your appointment to sleep without interruption from jaw clenching and teeth grinding once again. Bruxism is a serious condition that is all-too-often ignored due to its subtle symptoms. It may be caused by a number of sources, including stress, malocclusion of the teeth, or as a side effect of the sleep condition known as sleep apnea. Left untreated, nighttime teeth grinding can have serious effects on the teeth like wear, breakage, and fractures. Bruxism can also lead to a painful disorder with the jaw muscle known as the temporomandibular joint, or the TMJ. If you suspect your sleep is habitually affected by nighttime teeth grinding, don’t wait to seek a diagnosis and treatment from your general dentist in 38401 Dr. Alex Goodman. A custom nightguard is designed specifically for your teeth. It resembles the type of mouthguard you see athletes wearing, and it works by bringing the jaw into proper alignment and/or creating a barrier between your top and bottom teeth while you sleep. To fit you with your custom nightguard, we’ll take impressions of your teeth and send them off to our trusted lab, where your device will be created especially for your mouth out of a smooth, comfortable plastic. Once you receive the device, you can begin using it immediately. Caring for your nightguard just takes a few simple steps. The device should be brushed gently with a non-abrasive toothpaste and rinsed upon waking each morning, and then stored in its cool, dry container when not in use. With proper care, the nightguard can be expected to last up to 10 years without a need for replacement. 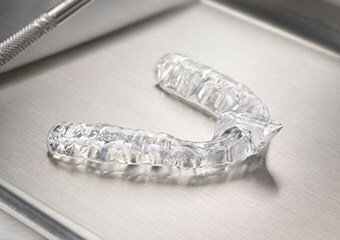 Our patients who have found relief with a custom nightguard for bruxism agree -- it’s well worth the investment for protected teeth and sounder sleep. If you’re dealing with the destructive side effects of bruxism (nighttime teeth grinding), please don’t wait to contact Goodman Family Dentistry. Untreated, the condition can significantly damage an otherwise healthy smile -- but we’ll protect your sensitive tooth enamel with a nightguard that’s fit especially for your mouth. Call us to schedule an appointment for your custom nightguard in Columbia, TN today!